As a result of more than 10 years of research, with the highest technology and a multidisciplinary team of experts from different fields (biologists, doctors, pharmacists…), KERIBA food supplements have emerged. 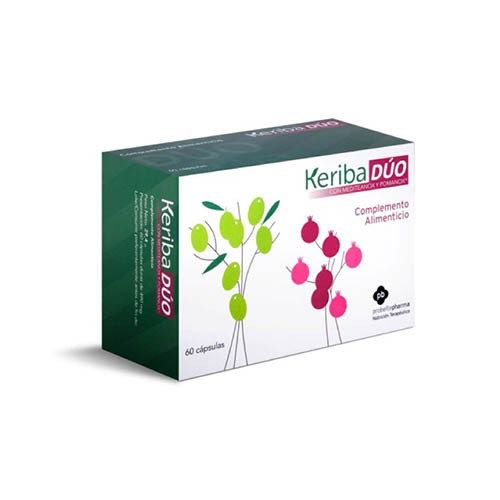 The KERIBA line is composed of different products based on natural extracts from the olive (Mediteanox®) and pomegranate (Pomanox®), which due to its high purity, provide the amount of polyphenols necessary to perform the desired activity in the body. That is why Probelte Pharma has and provides the result of years of research, translated into a line adapted to the needs of daily life. “ We cannot turn back the time, but we can delay the effects of the aging process”. 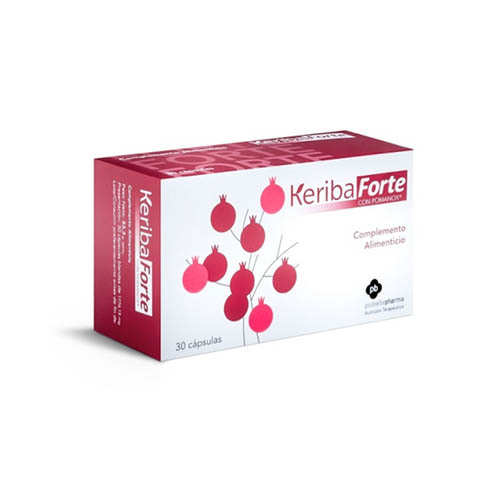 Keriba Forte with Pomanox® is a Dietary Supplement based on Pomanox, natural extract from the entire fresh pomegranate fruit, achieving one product highly purified and rich on polifenols (antioxidants). Everybody knows that execise is essential to mantein a healthy style of life, but sometimes, because of regular daily activities and the tiredness, hamper us to practice it regularly. 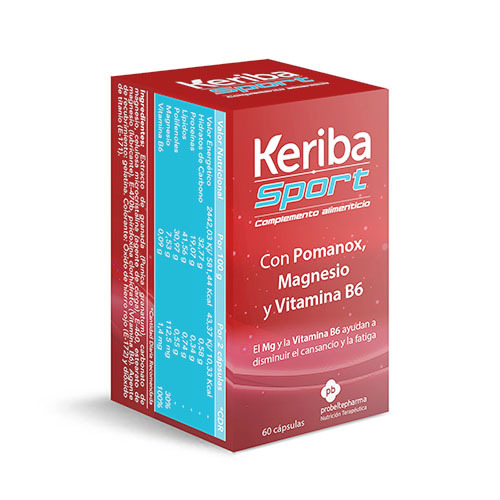 Now Keriba Sport enables you to fill you up with energy and fight the fatigue thanks to Pomanox, Magnesium, and vitamin B6 to take on the exercise that before you could not accomplished. It is well known that Extra Virgin Olive Oil has many extra healthy cardio vascular features, due to its high content of polifenols present on the olive. For this reason, Probelte Pharma has developed and extract of natural purified origin, obtained from the fruit of the olive tree, Mediteanox®, with high concentration as well as purity on hydroxytyrosol, which is the main polifenol responsible for the outstanding healthy properties of the olive oil. 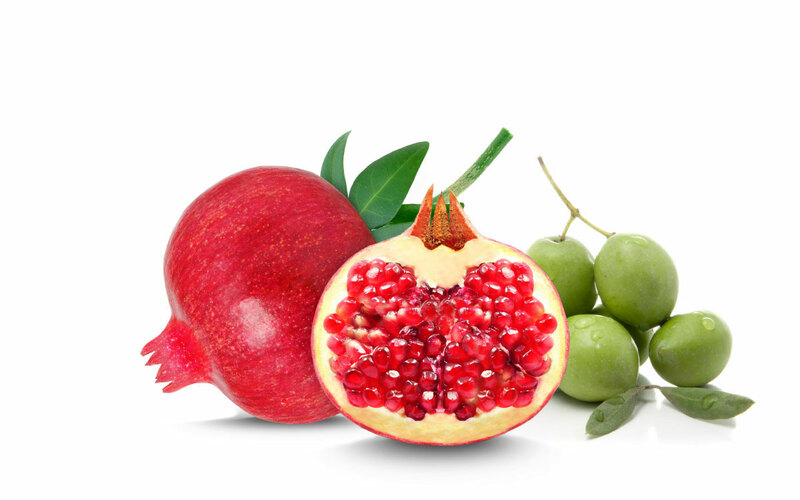 Granadox® is a natural pomegranate juice, without additives and added sugars, grown and cultivated in Spain. 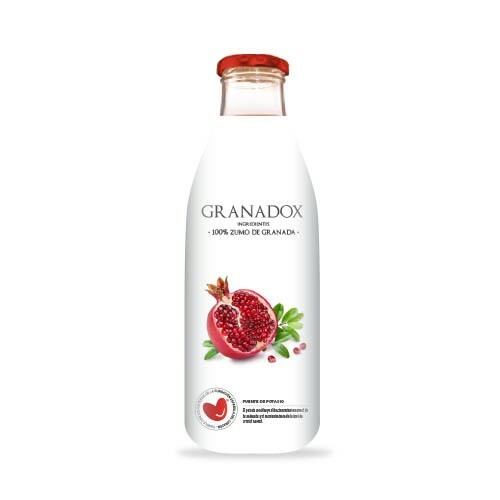 Granadox® contains 100% of pomegranate juice, rich on vitamins (A, C, D, K, B1, B2, and NIACINA), minerals (potassium, phosphorus, iron, zinc, calcium) as well as powerful natural antioxidants (punicalagins) from the Pomegranate (Punica Granatum).